Snow White and the Seven Dwarfs is 72-years-old and it is coming home in a bright and shiny Blu-ray high-definition transfer that is simply a must own for any fan of 2-D animation and a requirement for any Disney buff. This is the third classic Disney feature to hit Blu-ray along with Sleeping Beauty and Pinocchio and like those two it is simply beautiful. The package includes a two-disc Blu-ray Diamond Edition release and also includes a single disc DVD for those that may be looking to adopt Blu-ray in the future or may want the DVD edition to keep the kids entertained in the car. Disney is also doing something a little different with this release and making it available in both Blu-ray and DVD style packaging supposedly so it will fit in better with the rest of your collection. I guess that would make sense if you didn’t own any other Blu-rays, but at this point it’s hardly an issue to concern yourself with. 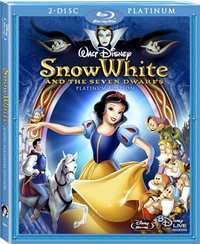 Packed with new features as well as bringing back vintage features from previous DVD releases, Snow White and the Seven Dwarfs (Diamond Edition) release is a two-disc set with the first disc beginning with the feature film accompanied by an audio commentary with author and film historian John Canemaker who guides us through the commentary made up largely of audio quotes from Walt Disney himself. Unfortunately I am never a fan of these puzzle piece commentaries and this one is really no different, especially considering the wealth of features on the second disc more than make up for skipping over this commentary if you so choose. Next is the first part in the Backstage Disney features including a look at what was most likely going to be a Snow White follow-up short titled “Snow White Returns” which is presented in storyboard form and shows how it makes use of two deleted scenes, which you can watch separate from this feature. Since the two deleted scenes are pencil drawing animations the are much more entertaining to watch than typical storyboard-only animated film deleted scenes, and watching the “Bed Building Sequence” is a good one to make sure and watch as it plays into additional features along the way. On top of a series of games and a music video for a pop version of “Some Day My Prince Will Come” my favorite feature on the first disc is probably the DisneyView option, which is something I brushed over in my Pinocchio review but really quite enjoyed with Snow White. Hand-painted panels from animator/artist Toby Bluth are inserted to fill the right and left side of the screen to make it so the film fits the entire width of your widescreen television. The paintings correspond with the scene you are watching and it just makes for a more pleasant viewing experience and I plan on heading back to Pinocchio to give it a second look. Disc two is where you hit a major load of behind-the-scenes goodies as Backstage Disney part two takes over with so many little featurettes and tidbits there are too many to count as they delve into the story, art, music and character design of Snow White. The features include storyboard galleries, such as character designs and abandoned storylines. Next are one to 17 minute featurettes looking at the making of the film and the origin of the story from Walt’s point of view. Then there are a trio of Silly Symphonies including “The Skeleton Dance”and “Babes in the Woods,” which is instantly comprable to Snow White’s mad dash into the woods at the hunter’s behest. Finishing off the second disc is a group of features from the earlier Snow White release. This was a very risky venture. If Snow White failed, the studio would have failed. Learning what you will about Walt and his work ethic and focus on the concept of “team” is sure to impress you as I am sure it has on any other Disney special edition you may have watched, but considering this is the film that solidified an empire there is a lot more to take away. I can’t recommend this one enough. Along with Criterion releases, classic Disney animation is reason enough to upgrade to Blu-ray, and once you do you’ll never look back. Get more info on this title here! Stay up to date with everything Home Video related from reviews, release dates and newly announced DVDs and Blu-ray Discs in the RopeofSilicon Home Video Central.